Having operated for the past 40 years, Armitage Auctions, Invermay, Tasmania has been acknowledged as a highly professional business with experienced and friendly staff who possess a keen eye for all manner of items; anything from your normal household contents to quality antique furniture and china etc., also special collectors items. 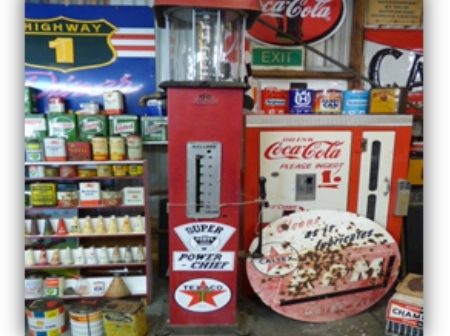 On June 25 Armitage is holding a special petrol memorabilia collectors auction and encourages collectors from all over the country to come and check it out as the first auction was a raging success with punters flying in from around the country. If you’re looking to deck your man cave out or start it from scratch with a car theme in mind, this might just be the perfect platform for you. Great selection of signs including Waratah, Plume, Castrol, Golden Fleece, Caltex, Goodyear, Texaco, Mobil, Pegasus, Peters & Brasso. 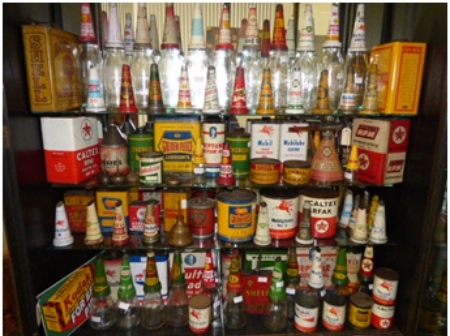 Oil Bottles, tops and tins including Castrol, Shell, Mobil, Caltex, BP Energol, Ampol, Neptune, Golden Fleece & Firezone. Many assorted bowsers, highboys, bottle stands, oil boxes, pedal cars, Michelin Man figure, plastic ram, Coca Cola drink dispenser, radios, typewriters, 1952 Pontiac sedan 350 Chev, 1957 AS International wagon and much more.